It's no secret that flowers add beauty to your wedding ... gorgeous draping floral canopies, floral wedding arches, pew arrangements, wreaths, centerpieces, and more. They set the stage for your walk down the aisle, dress up the ceremony venue, and adorn the reception tables. By the time you add up all the bouquets and arrangements, you can quickly bust your wedding budget. Keep your floral arrangements simple. For your centerpieces, use hand tied bouquets. These require much less labor than complex arrangements that have to be pinned to foam boards or that require on-site assembly. Concentrate your floral budget on the flowers that will show the most. This includes your bridal bouquet, flowers on the altar, and the centerpieces. Use candles as centerpieces instead of fresh flowers. Then decorate the reception tables with small inexpensive wedding favors at each place setting. This also gives your guests a small memento from the wedding. 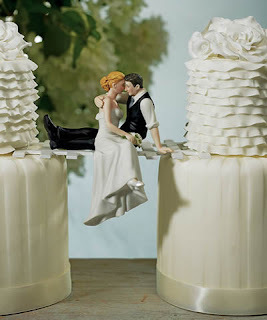 Use a fun cake topper instead of flowers on the wedding cake. The cake will be disassembled anyway ... why not choose a whimsical cake topper that reflects your personality or hobbies? It becomes a conversation piece for your guests and a keepsake for you after the wedding. Choose a smaller wedding party. 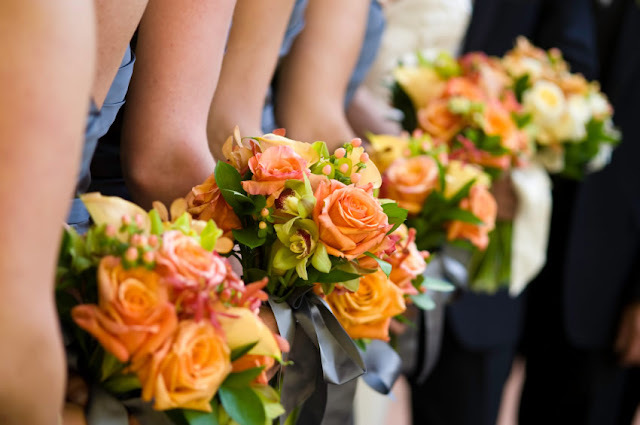 Ten bridesmaids can mean ten bouquets totaling $1000 or more on the high end. Avoid having your wedding around dates where there is peak demand for flowers. This includes Mother's Day and Valentine's Day. Not only will your florist be extremely busy, but the price of the flowers can almost double. Choose a beautiful venue. If you select a venue with incredible beauty, either architecturally or interior decor, you won't have to spend as much on floral arrangements to decorate it. Talk with your florist to see if he or she has done a wedding at your venue previously. It's likely that s/he will have some ideas on where you actually need fresh flowers versus where you don't. Florists understand weddings and will often provide great advice on how to how save money by selecting less expensive (but equally beautiful) flowers. They can also provide guidance on making flowers look incredibly lush, using a few of your favorite expensive buds as the focal point and combing them with less expensive fillers. Take advantage of your florist's expertise and you are sure to have a gorgeous floral spread without busting your wedding budget. Do you have any money saving tips for your wedding flowers? We'd love to hear them! Take 15% off your entire order at WhereBridesGo.com with coupon code WEDDINGFLOWERS, plus get FREE SHIPPING on orders over $100. For a great selection of affordable D.I.Y wedding favors, pre-packaged wedding favors, and wedding cake tops, check out WhereBridesGo.com!